IP networks have been expanding rapidly and are widely adopted throughout the world IP video monitoring systems provide the latest security and monitoring solution that allows you to leverage the use of existing, globally accessible, IP infrastructure. Simply connect an IP camera to a network and you can monitor live images from the camera on your networked PC anytime, anywhere, around the world. 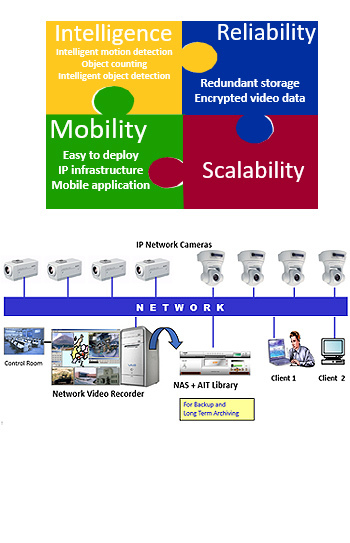 What’s more, technological progress, such as with audio and video compression techniques, makes it possible for you to monitor moving images and audio over these IP networks. There are a number of other convenient features available with IP video monitoring systems that are not available with conventional CCTV systems, such as wireless connectivity, sending images to a select group (Multicasting), and higher resolution images. Feature-rich yet easy-to-use IP video monitoring systems are an ideal solution for today’s remote monitoring and market research applications in locations such as banks, transportation facilities and roads, schools, public venues, industrial facilities, and shopping malls. And as an additional revenue-generation tool, IP video monitoring systems can be used for online web attractions inlocations such as zoos, museums, theme parks, and more.